Our mission is to collaborate with community leaders, non-profit organizations, and volunteers to enhance the quality of life. We will help to bring closure to issues that arise in the lives of many victims. Results will show victims spend less time searching for help and more time rebuilding their lives with our support. The organization acts as an agent to inform residents of the many private and government resources available to them. We also help people overcome the hurdles, fears and misinformation about these public services. These resources allow residents to resolve their many burdensome situations and make their lives more manageable. Our staff and volunteers have helped resolve critical issues such as, aiding fire victims, helping people who suffer from lead poising in obtaining medical care, and advocating for victims of crime and abuse. We provide these services through both a combination of one-on-one personal assistance as well as large-scale public information events. 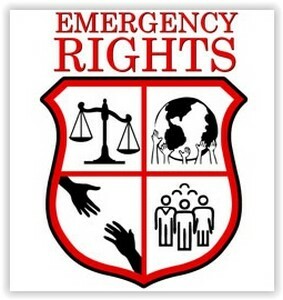 After the flames are out, Emergency Rights can help. Our dedicated staff and volunteers collect clothing, food, furniture and financial donations to help assist families that have lost their homes due to a fire. In a couple of cases, our organization succeeded at filling an entire apartment with new, donated furniture so that families could start their lives again. Our combined effort with the Police Department and other domestic violence organizations helps to end and prevent domestic violence. In addition to one-on-one support, we also offer a free domestic violence self defense class for victims. It only takes one phone call to save a life. Contact us if you or someone you know might be in a domestic violence situation. Our caring staff will explain the services available at our organization and through government programs. Emergency Rights advocates for families of crime victims throughout the entire Law Enforcement, Attorney, Court and Social Work process. We also provide personal support and counseling to the family and friends of the crime victims during these tough times of loss. Our organization raises funds for funeral expenses. We report all crime victims to the Crime Victims Board for further assistance. In cases of national and local need, the Emergency Rights staff and volunteers are ready to contribute to South Bronx relief efforts. To the best of our ability, in any disaster, we help those in need and assist police and fire officials. For example, our organization mobilized a team to support victims of the September 11th attacks. And, after Hurricane Katrina, we quickly recruited South Bronx volunteers. These volunteers collected food, clothes and other necessities and drove a truck to deliver the emergency aid to the hurricane victims.